but the picture was taken in North America, I assume, wasn't it? If so, I'd wonder if 'groj' be a spelling joke, like '4' for 'four' or 'for', or an error (hardly believable, but in this world...). Yes, the photo is from the US. 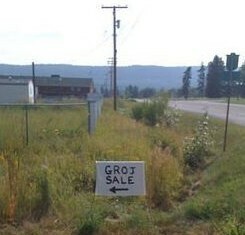 The spelling groj is apparently quite widespread there. Some people think it is an acronym from "get rid of junk". I'm American, and I've never seen that spelling before, and, frankly, didn't recognize it as an English Language word reading the subject heading of this blog. In the photo though, it was totally transparent. Of course, that I haven't seen it just means it hasn't spread to one small section of one city. John, it would interest me if you think (such thinks you certainly can _aus dem Aermel schuetteln_, I don't know the English idiom) that as a result of the sleb-groj-compression initial consonant clusters can arise that have not so far existed in English. I can't off the top of my head think of any. If they can't, why? I could imagine /sr/ arising from a word like "syringe". Of course, there it's [ɡrɑʒ]. I too was nonplussed by this sign when I first saw it (American from the Southeast, currently living in the Northeast). I did figure it out eventually by avoiding the IPA pronunciation and saying it out loud. I've definitely never seen this spelling before. The first page of google hits for "groj" does turn up one instance of "groj sale", but the rest were seemingly unrelated, and some were Slavic. I think the reason it is so tempting to treat this as a non-English word is that J is virtually never word-final in English. Regex dictionary lists only "raj", "taj" and variant spellings of "hajj". In fact the only native word I'm aware of in any langauge where word-final J represents a fricative or affricate is Romanian, in the place-name Cluj, which I've only heard of because of the exploits of its (association) football team. It took me a while to get it too. Wojciech: Two examples of sleb-compression that create abnormal initial clusters are AmE /dʒɹæf/ for giraffe and French /ʃtɔf/ for je te offre ... 'let me buy you ...' when a vowel follows. John: Word-initial [dʒɹ] made me think of the people who have it in words such as "drink". Indeed I mentioned that in the comments on the "sleb" post. For me the potential compression in "giraffe" and "Jerusalem" produces something very like the cluster in "drink". On the other hand, words like "derivative" have the potential to reintroduce /dr/. Also on Wojciech's topic, I think [ˈmɹalɪtɪ] is possible for "morality". thank you for your examples. I was asking about English only. As for French what about 'je ne te l'offre' (I am not offering it to you)? Depends on the exact strategy of e caduc-deletion, which I am not so skillful at. Are you? 'mrality' looks great, sort of Bantu-like, doesn't it? It's comforting to know that sleb-compressions do generate new initial clusters. The very first page my google turns up is a Polish site with games. 'groj' is dialectal for 'graj', or 'play' (in the imperative mood). The 'j' is a relict of the Indoeuropean -i for the optative mood. On seeing John's photo I was not nonplussed for more than a fraction of a second, maybe because, unlike some of you, I am not in love with phonetics and don't subconsciously expect street-signs in IPA symbolism. I immediately read it aloud the American way and it turned 'garage sale'... . In my pronunciation it's "jrive". What we're talking about here is actually a nice piece of evidence for this: for me compressed "giraffe" is like "drive", but compressed "derivative" is not. Do you also say 'chree' for 'tree'? But 'trahno' for 'Toronto'? Yes, "chree" for "tree". Probably "Tronto" (i.e. [ˈtɹɒntö]) for "Toronto", if it isn't three syllables. I don't think so, no; it feels totally alien to say it that way. But bear in mind that I'm from the other side of the Atlantic; it's not a place I talk about very often. No: the shift to /tʃ/ or /dʒ/ generally only happens when the compression has been lexicalised, which it hasn't been in these words. When words which start with /tər/ or /dər/ get compressed, it doesn't (as far as I can tell) affect the initial consonant. But I mean, would you say 'trentshal'---rather than 'chrenshal'? I am asking because you said that 'Toronto' was a rare word in your vocabulary (active). Its lexical entry starts with /tər/. So no "chr". The point about "Toronto" is that I've got the impression that some people more familiar with the place than I am might actually have a two-syllable lexical entry there. (I might be wrong.) And if I did I think it would get "chr". Absolutely. The local pronunciation is "Tronno". At home, on the prairies, we said [ɡə'ɹæ(d)ʒ]. Does anyone else recognize this pronunciation? That's a normal North American pronunciation. None of the commenters seems to think there's any difference between the pronunciations [ɡəˈɹɑːʒ] and [gɹ̩'ɑːʒ]. There is for me. For example, I always say [pɹ̩'uːz] and always [pəˈɹaɪə], but can say either [pɹ̩'eɪd] or [pəˈɹeɪd]. And the spelling "groj" makes me hear [gɹ̩'ɑːʒ], but maybe that's just me. Are there really only 20% of us from the mid 1930s who say garage like I do? Toronto? affricated Tronto. You can usually spot a true (Thames) estuary speaker by (also africated) estri. I had no trouble reading the sign. (Californian, b.1959) As a child, I'm sure I pronounced "garage" that way (and spelled it "grodge"-- because everybody knows you can't end a word with a "j.") As an adult, I think I usually pronounce it in two syllables, or maybe just one and a half. Or maybe I'm just imagining the first vowel... I can't say I've ever seen this spelling before. So simple it looks foreign. I had no idea what the sign meant at first (Canadian, b. 1988), and I use "garage sale" as the primary term for that kind of event, and pronounce it in the relevant way. are you sure your vowel in the stressed syllable of Toronto is ʌ? Canadians have a cot-caught merger in favor of cot, but this /ɒ/ could easily be realized as [ʌ]. This Canadian accent happens to be my own native speech. Cot-caught is fully merged for me as ɑ — the same vowel in the stressed syllable of Toronto. The ɒ vowel is not part of our regular inventory of vowels. You seem to suggest that 'cot' and 'caught' could easily be realized with the same ʌ of 'cut'. I'm afraid I disagree completely. Maybe John Cowan repeatedly misheard an ɑ for an ʌ. Would that not be the simplest explanation? It was Julie, not John Cowan, who supplied the pronunciation of Toronto with ʌ.
John C was careful to do do what John W was talking about in the previous thread the quality of SQUARE. His careful use of brackets ensured that he implied no more that than the phoneme /ɒ/ could be realised by an allophone with the sound quality [ʌ] in that one word — leaving it open whether the realisation might occur in similar contexts. This is very different from saying that the allophone is identical to the phoneme shared by all the words in the lexical set CUT. It doesn't seem strange to me that somebody who lives in a place uses a local pronunciation that isn't shared by people with the same accent who happen not to live there. In England there are towns with three common pronunciations: what the inhabitants say, what the neighbours say and what the rest of the country says. I understand the subtly in the use of the // and  brackets; however, I do not believe this particular shift in vowels is particularly valid. 1) /ɒ/ is not a phoneme in Canadian English. 2) the /ɑ/ allophone of /ɒ/ is not realized in any widespread way in our accent as [ʌ]. 3) if Julie's stressed vowel in Toronto is really [ʌ] (and not an error in transcription) hers may be a "one-off" pronunciation. I agree with your (2) and your (3), and (3) is indeed what I meant. But if I choose to write the merged PALM=LOT=THOUGHT=CLOTH of CanE with /ɒ/ rather than /ɑ/, I am within my rights, since the whole point of the merger is that the roundedness of this vowel (as well as its height, as between open and mid-open) is sub-phonemic and variable. Notating it /ʌ/ would be rather extreme, and I'd need a different symbol for the STRUT vowel, presumably /ɜ/. Phonemic symbols, like Humpty Dumpty's words, mean what the user wants them to mean — as long as necessary distinctions are maintained somehow. But you are speaking of the "/ɑ/ allophone of /ɒ/", which is self-contradictory. If [ɑ] and [ɒ] are allophones, they can't be distinct phonemes. if Julie's stressed vowel in Toronto is really [ʌ] (and not an error in transcription) hers may be a "one-off" pronunciation. That's what I understood John to be saying. One-off pronunciations of place names are not exactly uncommon. The concept of an 'one-off' pronunciation flummoxeth me. I don't seem to have ever heard of any other language---but English---that knew of a thing like that. Maybe because in most languages (written in an alphabetic script) the spelling more or less forces the pronunciation on the reader, while it English, due to its irregularity, it does not? Yet not even that explains the phenomenon entirely. Do you, gentlemen, know many---or quite a few---examples of 'one-off pronunciations"? I can't speak for nedecky, but what I mean by a 'one-off' in this case is that the second syllable in Toronto has changed its vowel quality — leaving all other instances of the LOT vowel unchanged, even in a syllable with following /n/. I'll try and dig out some place names with seemingly perverse one-off pronunciations. What I mean by a "one-off" pronunciation in this case is not that the common pronunciation of the place name betrays the spelling, but that this obscure pronunciation seems isolated to an individual speaker. As for Toronto, (the city in which both Julie and I live), we are talking about an urban population of almost 3 million people in its centre. Surely, this is different from the towns in England to which David Crosbie refers, where pronunciation varies between local "inhabitants" and "neighbours". Regular analysis of the accent of an individual speaker should allow a phonetician to predict the quality of the vowel in the second syllable But the placing of stress is surely a lot harder to predict, given that there are two standards. would that not belie the principle, coined by the Neogrammarians, that phonetic laws are exceptionless? That is, once vowel A gets replaced by vowel B, it gets so replaced everywhere, in (virtually) all words, unless its scope is restricted to some phonetic context? maybe what we mean is let's say an 'idiosyncratic' pronunciation, i. e. a person's acquiring the habit of 'mispronouncing' some specific word, e.g. 'Toronto', due to some strange circumstances obtaining at the moment when the person was learning that word? The Neogrammarian principle was just something that worked. Before it was possible to do 'phonology' (now = historical phonology) in any old sloppy manner that would yield the results you started with. As an investigative procedure phonology can't afford exceptions. But there's no grand theoretical project to explain why Julie is confident that she calls her home town təɹʌno , often reducing to tʃɹ̩ʌno and most often to tʃɹʌnə . It's not like inferring the sound system of Proto-Indo-European. We may not reach a definitive explanation of why Julie's pronunciation of Toronto differs from Nedecky's. (Indeed, we may never know whether it really does.) But if we do reach such explanation, it's unlikely to explain anything else. Sound changes can't occur without speakers. And the speakers' behaviour is not like a column of soldiers simultaneously executing a right turn at the word of command. It isn't even like a flock of birds changing direction in an instant with no apparent leader. As teardrop reminds us, William Labov demonstrated that while a speech community is in the middle of a sound change, individual speakers are affected by different factors under different conditions. I think I heard something in the news the other day about the disappearance of the New York rhotic accent. 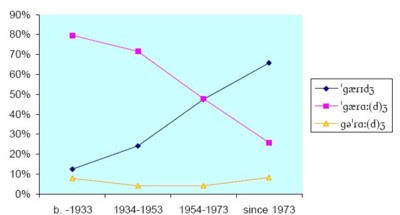 Labov gave us a wonderful snapshot of the diversity of pronunciation when the change was in transition. Besides, the 'without exception' argument is circular. True uniformity is only possible within a single language, dialect, accent or however one delineates the body of speakers. But we can't define any body of speakers without criteria of uniformity — including uniformity of pronunciation..
well I of course knew _that_, but thanks for telling me... repetitio est mater studiorum... The thing is, in such cases some soldiers turn right somewhat brisker than others, and so there are minute time-lags and such, and also the exact kinematics of the respective right-turns is somewhat, infinitesimally perhaps in a well-trained troop, different. But that it is. In language, that is like some people's taking to 'abite and arinde the tine' first and some obstinately sticking with 'around and about...' for a decade or so, ... things familiar, certainly. But in the case of the Julian 'terunno', it's like---well, a soldier executing a command not with a time lag, and not not at all, either, but, like, a quite different a command---as if the sergeant had cried 'present, arms!' rather than 'turn right'. And of course we can say: well,things happen this way or that way, as the case may be. But that's a capitulation of all theory-building, isn't it? Re circularity---I am getting you, but in this case the body is quite naturally delineated: the 'Terunnians'. Sound changes are indeed exceptionless — except when there are confounding factors, and the commonest of these is analogical leveling. The massive extension of the Old English plural ending of a-declension nouns to all nouns with only about 40 exceptions is a good example. Likewise, in the Lutherbibel we find er bleyb, er fand versus sie blieben, sie funden, where contemporary German has levelled the forms to blieb(en), fand(en). The other main factor is dialect mixing, which gives us vixen rather than fixen as the feminine of fox. Mixing is spectacularly illustrated by the varying outcomes of Old English /y/, which gave us king from the East Midlands, merry and knell from Kent, and such and dusty from the West Midlands, the main source of the standard language. Indeed, bury and busy are spelled West Midlands style, but pronounced Kentish ("berry") and East Midlands ("bizzy") respectively! I don't think we have a phonetic exception here. Sometimes the pronunciation of a word has a split at the phonemic level, which obviously affects its phonetic realization. In AmE, stressed from or what have taken on /ʌ/, and this pronunciation now coexists with the more traditional pronunciations with /ɑ/. Maybe for Julie, Toronto falls in the same group as these two words. Re 'what' no doubt, tho' this pronunciation has seldom failed to baffle me. But there sure are such facts and 'what' is one of them. However, does that not fly in the face of the above-mentionend Neogrammarian dogma, turning like up-side-down all historical lingustics, of which the principle is a corner-stone? Yes, "idiosyncratic" pronunciation (or "phonemically indiosyncratic") would be better here. This kind of thing definitely happens in all languages (especially among speakers who haven't been "fully formed", e.g. children). Just that English, due to its spelling system, might be more susceptible to it. And re Neogrammarian sound change: not all sound change has to be Neogrammarian. Labov has written quite a lot about this. which part of the Laboviam work specifically are you referring to? I have a very general familiarity therewith, like his studies on the Northern Cities Shift and such-like. I don't deny that there are such idiosyncratic pronunciations, far from that! Yet it'd interest me if, aside from registering them for what they are, we have already constructed a _theory_ to explain them, a theory of equal 'dignity' as that of the Neogrammarians. Well, there are two chapters about what he calls the "Neogrammarian controversy" in the first volume of the Principles of Linguistic Change. He discusses both ends of the stick. thank you, I shall look up this reference at the nearest occasion. I am not a linguist, alas.